Ride and Stride Week 2017 runs from 16-20 October 2017. All staff are encouraged to think about how they might come to work one day in the week by leaving the car at home and coming either by public transport, walking part of the journey or cycling. Precinct partners are working across government to improve transport and access at Westmead. This includes the City of Parramatta, Parramatta Light Rail, Roads and Maritime Services, Transport for NSW, Sydney Trains and the bus operators. 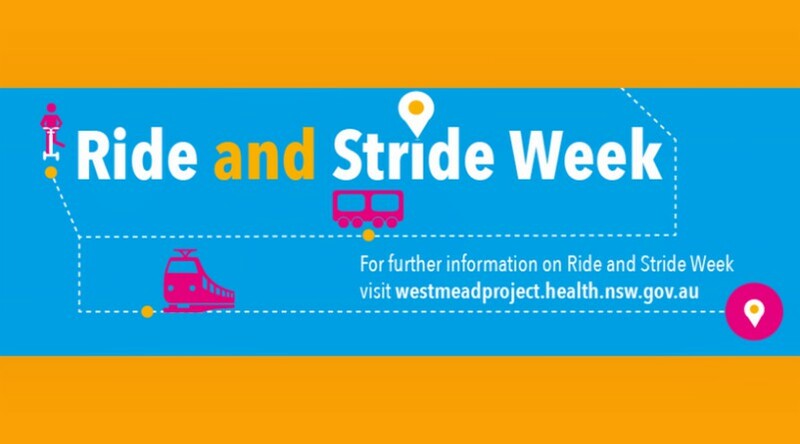 We are reaching out to staff, patients, carers and visitors to help us build better linkages to and from the Westmead precinct by providing feedback about their experiences riding and striding during the week. There is lots of exciting activities planned, including free e-bike trials, cycling road safety pop-up events, a free cyclists breakfast, free smoothie bikes and even a free sausage sizzle! So get involved and help us celebrate our second ever Ride and Stride Week. If you have any questions or would like to know more about how you can get involved, contact us. Specialized electronic pedal-assist bicycle free trials: Corner Darcy Road/Hawkesbury Road, 11am—2pm. Glow Worm electronic pedal-assist bicycle free trials: The Children’s Hospital at Westmead front entrance, 11:30am—1:30pm. Ride2Work Day breakfast for cyclists: The Children’s Hospital at Westmead front entrance, 6:30am—9:30am. Parramatta Police Bike Squad pop-up event: The Children’s Hospital at Westmead front entrance, 7:30am—10:30am. Bicycle maintenance workshop: The Children’s Hospital at Westmead in the Chinese Gardens, 11am—2pm. Parramatta Light Rail/Transport for NSW pop-event information event: Westmead Hospital front entrance, 9:00am—1:00pm. Queens Road Cycleway Official Opening: Corner Darcy Road/Hawkesbury Road, 11am—1pm. Bicycle NSW ‘Minimum Passing Distance Challenge’: The Children’s Hospital at Westmead Galleria, 11:00am—2:00pm. Coleman-Grieg Challenge: Parramatta Park, 6:30am—9:00am. Parramatta Light Rail/Transport for NSW pop-event information event: The Children’s Hospital at Westmead Galleria, 9:00am—1:00pm. Visiting our wards? We want to hear from you! 07 Nov, 2017, 12:58 pm Emma Smith Comments Off on Visiting our wards? We want to hear from you!